An arithmetic series is the sum of the terms of an arithmetic sequence. A geometric series is the sum of the terms of a geometric sequence. There are other types of series, but you're unlikely to work with them much until you're in calculus. For now, you'll probably mostly work with these two. 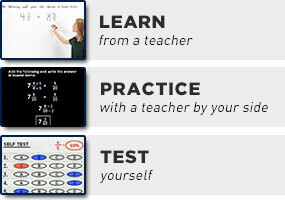 This page explains and illustrates how to work with arithmetic series. For reasons that will be explained in calculus, you can only take the "partial" sum of an arithmetic sequence. The partial sum is the sum of a limited (that is to say, a finite) number of terms, like the first ten terms, or the fifth through the hundredth terms. If you take the "2" on the right-hand side of the "equals" sign from under the n and convert it to being a one-half multiplied on the parentheses, you can see that the formula for the sum is, in effect, n times the "average" of the first and last terms. The sum of the first n terms of a series is called "the n-th partial sum", and is often denoted as "Sn". I could have found the common difference in the above sequence simply by looking at the formula for the sequence's terms. Because this is an arithmetic sequence, then each term is a fixed amount larger than the previous term. If we'd been using a continuous variable, such as the "x" we used when graphing straight lines, instead of the discrete variable n, then "
" would be a straight line that increased by one-half at each step. We can use what we learned about the slope of a straight line, and how this relates to the equation for a straight line, to read off the common difference from the formula for the terms... which can save some time on the test. The quickest way to find the value of this sum is to find the 14th and 47th partial sums, and then subtract the 14th from the 47th. S14 is the sum of the first through the fourteenth terms. By doing this subtraction, I'll have deducted the first through fourteenth terms from the first through forty-seventh, so I'll be left with the sum of the 15th through 47th terms. By the way, this subtraction could also be expressed as "S47 – S14". Don't be surprised if you see an exercise which uses this notation and expects you to extract the meaning of it before you can begin your computations. You could do the above exercise by adding terms until you get to the required total of 21. But your instructor could easily give you a summation that requires, say, eighty-six terms, or a thousand, before you get to the right total. Even if you could do all the steps, it would be a ridiculous waste of time, especially on a test. So make sure you can do the computations from the formula. They've given me the first and the last terms of this series, but how many terms are there in total? I'll have to figure this out for myself. Next, we consider geometric series.